If you've ever tried to do nutrition-sensitive agricultural market development, you may have found that, at times, the combination of agriculture and nutrition was a no-brainer while at other times you were hitting an inexplicable brick wall. Why is that? Areas of convergence—where the principles or practices of nutrition and agricultural market development activities are complementary and create synergy. Areas of tension—where the principles or practices of nutrition and agricultural market development activities are at odds. The nexus of agriculture and nutrition programming is increasingly recognized as critical for achieving the ambitious goals of the Feed the Future Initiative and the USAID Multi-Sectoral Nutrition Strategy. 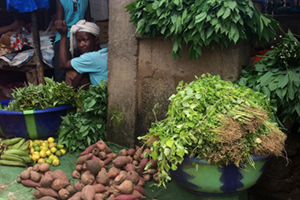 This webinar explored how the areas of potential convergence and tension create opportunities and challenges in the design and implementation of nutrition-sensitive agricultural market development activities. Participants also engaged in a discussion of practical examples of ways in which tensions have been addressed and convergences leveraged in their programming. Ruth Campbell, Senior Vice President at ACDI/VOCA and Managing Director of USAID Leveraging Economic Opportunities (LEO) presented in this webinar, along with USAID respondents Sally Abbott, Nutrition Advisor at the Bureau for Food Security, and Kristin O'Planick, Market Systems & Enterprise Development Specialist of the Bureau for Economic Growth, Education and Environment (E3) Office of Trade and Regulatory Reform.